The ATP World Tour Finals showdown ended before it even began as Roger Federer pulled out through injury. The 33-year-old Swiss, who spent two hours 48 minutes defeating compatriot Stanislas Wawrinkain a gruelling semi-final the previous night, announced his decision on court as the 17,000-seat O2 Arena filled up for the expected final. 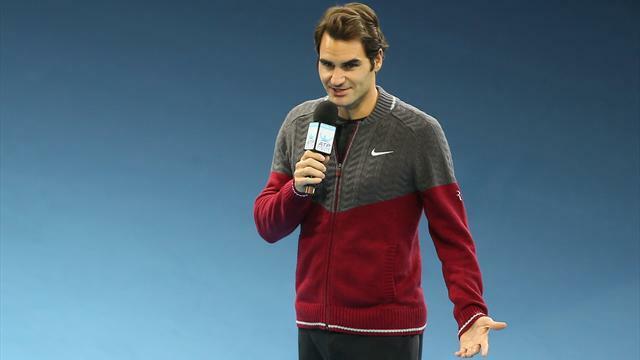 World number two Federer, who was bidding for a seventh title at the year-ender, apologised but told the crowd he was not “match-fit” after developing a back problem. Despite the huge sense of anti-climax in the crowd, some of whom had forked out thousands of pounds for a courtside ticket, there was no booing, with applause breaking out as seven-times Wimbledon champion Federer spoke. Djokovic becomes the first player to win the Tour Finals title three years in succession since Ivan Lendl (1985-87) but was not really in the mood for celebrating when he collected the trophy and $1.92 million cheque. “Obviously not the way I’d like to win this,” the 27-year-old Djokovic, who clinched the year-end world number one ranking for the third time in four years this week, said. “I feel sorry for Roger. I’ve been in tennis 10 years and I know Roger and Rafa (Nadal) have been the biggest competitors and always give their 100 percent. If Roger could have come out and played he would have played. “I’m not the kind of player to celebrate these wins, but I have to celebrate the whole season and this trophy is the crown on the season,” he added. ATP executive chairman and president Chris Kermode, standing alongside Federer, then announced that British number one Andy Murray, who failed to qualify for the semi-finals after being thrashed by Federer on Thursday, would play Djokovic in a one-set exhibition match instead. That would be followed by an exhibition doubles between Murray and John McEnroe and Tim Henman and Pat Cash. Federer now faces a battle to be fit for the Davis Cup final against France which starts on Friday. Along with the Olympic singles title, the Davis Cup is the major honour which still eludes the 17-times grand slam champion, with Switzerland’s hopes resting on the shoulders of him and Wawrinka. Previous articleCristiano Ronaldo v Lionel Messi, Gareth Bale v Eden Hazard – are one-man teams taking over the world?